If you'd asked me a week ago, I didn't have any solid intention of being back on 2 wheels in the near future - ULEZ made it expensive for me to get anything decent within budget owing to everything having to be newer than 2007. 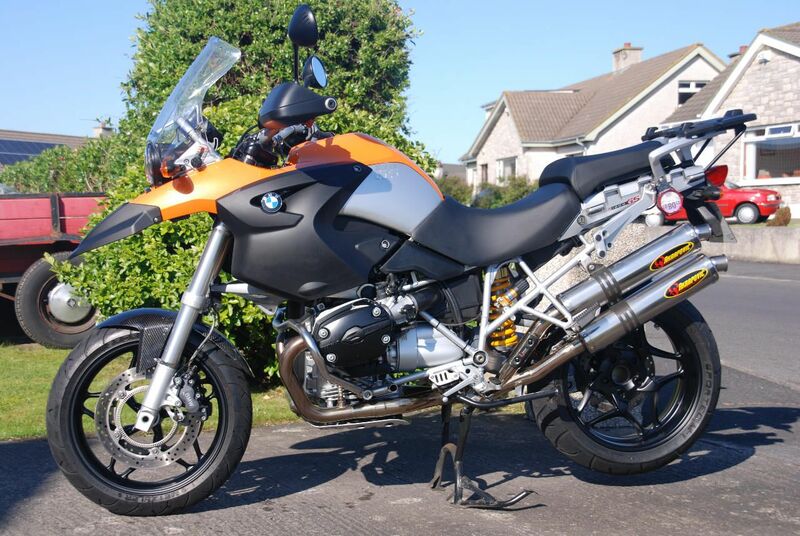 Anyway, things change fast and it seems I'm buying a 2009 R1200GS. Been offered it by a colleague at a price I'd have to be an imbecile to turn down. I'm just waiting on approval for a bit of cash towards it, but should hopefully be picking it up later in the week if all goes well. It's not a model I'd ever considered owning, but if I'm to own a GS at all, then this is probably the best for me since I've actually worked on it a couple of times including installing Wilbers front and rear, and a K&N air filter, and helped with balancing the throttles and doing the clearances too. I even went with my colleague when he bought it off the previous owner. Anyway, it's been well over a year since I rode anything at all so very much looking forward to being back on a bike. Anyway, I'll update when I have it! I'm buying a 2009 R1200GS. Been offered it by a colleague at a price I'd have to be an imbecile to turn down. Already been toying with what I could do with it longer term. If it really is that cheap, ride it for just long enough for the "Sorry mate, just couldn't get on with it" excuse to appear plausible, then get shot of it for a profit, before it turns into a money pit. Ask anyone who knows about BMW twins, everything after the 1150 is a financial disaster waiting to happen. Yeah I suspect I may well do that, probably a year before I could do so with a straight face mind. Is that the one I saw parked at your work? Was tidy as I recall. Vracktal This post is not being displayed . 2009 is a smart buy for an R1200, that's the generation with locknut and washer screw-type valve adjusters, the upgraded non-servo ABS and before they were drenched with electrobollocks. If looked after they can last for miles with only routine servicing. My R1200r is on 74,000 miles, only replacement part has been the oil window which had a slight weep and the front fork seals. 1) Don't hold the clutch in for long periods at traffic lights, get into the habit of putting it in neutral and letting the clutch out while you wait. Saves on wear. 2) Try to avoid slipping the clutch for prolonged periods, it's a dry unit. 3) If you have the tools pull all the bolts holding the generator cover off (front of the engine directly behind the front wheel), remove the generator cover then take out the sound deadening foam. It's a hateful design that traps road crud and water, rusts out the retaining bolts and causes all the paint to fall off the engine. I swapped all the bolts for titanium and put the foam in the bin after one of the original bolts snapped. 4) Nobody can agree on the right oil weight, type, semi synth or full synth etc etc. It makes no difference whatsoever as long as you keep the level good. Mine ran on 20w50 diesel engine oil quite happily for 3000 miles. 5) Changing out the gearbox and final drive oil for 75w140 improves shifting a bit on the tractor gearbox. Alternatively there's a site that converts the 90/90 21 spoked front wheel from an F800GS to fit the R1200GS if you want to look like you intend to take it off road. Yeah that's the one, he bought it on 14,000 miles which was probably around when you saw it - it's on 28,000 now so still fairly fresh if a little grubbier. The clutch does worry me a tad, not that there's any sign of it slipping or anything, but it's pretty much only ever seen London riding to my knowledge. Noted re. the holding it in, I do tend to do that so worth me bearing in mind. Yup, already on the radar! Will PM you re. the wheels. Looks mega and you've seen the work done on it in the last 14k, gives confidence. .....almost as bad as the Triumph old boys. They look like tanks, but the weight seems really low. And with the sticky out bits, should be excellent if you're worried about your boat floating away! Well, I've got it, and done my first commute too. It's huge! Needs a noisy pipe too, before I squish a chin-lit pedestrian. As Vracktal says don't treat the clutch like a Jap bike wet clutch, or you'll be changing it twice a year (and it's a cowson of a job). The engine is hugely tractable so get the clutch in and then hit the throttle. Nice to know about the clutch as I've just got the Adventure. I'm 6'2" and have the seat on the highest setting for the extra leg room. Sorry to hijack this but with clutch talk does the same apply to clutches in a car/van? I've never been one to hold a vehicle with the clutch for 2 mins at a set of lights, mainly due to slightly rubbish clutch control , I've just always wondered how much damage other people who do this were doing. Is yours a standard seat? If so want to do a straight swap for my tall one? I'm going to be caught out sooner or later if I have to stop on some wonky bit of tarmac or emergency stop when filtering. You should never ride the clutch in a car, that's how clutches go after 50k miles, and on a car they are never cheap. Most bikes have a wet multiplate clutch that can take a lot more abuse, but I think the BMW uses a car-style single plate clutch. temeluchus This post is not being displayed . The clutches don't' like abuse, but treated well will probably last all eternity. Some shite cruiser. Now with guns and FREEDOM! Clutches don't like getting hot. Makes them wear very fast. Get them really hot and you'll wear them out in minutes. Dry clutches are particularly prone to trouble, because there's nothing to cool them down. Wet clutches have a constant supply of oil to cool them. So slipped a dry clutch a bit is ok. It gets warm, then cools down. Riding a dry clutch is a bad idea, it keeps getting hotter. Bikes with dry clutches are normally low revving twins with plenty of torque. BMW and Moto Guzzi. It's adjustable from low to mountain. There are two bars under the seat that you adjust the height with. Yup, but mine is on low already, after speaking to the previous owner I think it may be a tall adventure seat or something, with the adventure suspension it's no surprise it's too tall for my distinctly average legs. I'm sort of getting used to it, but an inch or two lower would be nice, I ended up stopped on top of the road camber in traffic earlier and shat myself for a split second when I couldn't reach the ground on either side! Oddessy battery arrives tomorrow anyway, and new back tyre at the weekend, should be in a pretty decent state at that point, chuffed considering what I paid. The low seat can wait until pay day! The 1100S came with 3 seat height options as I understand it. You got the appropriate one for your leg length etc when ordering a new bike. Could be the 1200GS had a similar deal.